Captain Mahabir Prasad was born on 16th January 1936, at Kolkata, West Bengal. 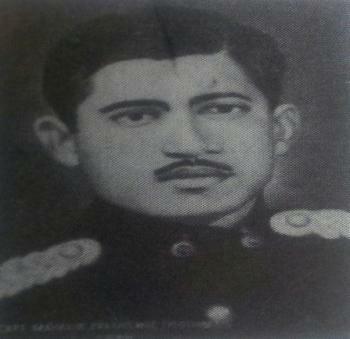 Son of Mr Indar Prasad, Capt Mahabir Prasad was commissioned to Indian Army on 9th June 1957. He got commissioned into the Sikh Regiment known for its valour and various battle honours. When the war broke out in 1962 with China, Capt Prasad with about 5 years of service was deployed with his unit in NEFA in the present day Arunachal Pradesh. Namka Chu, was a gorge situated east of the remote Tri Junction of Tibet, Bhutan and India. It was 200 km from the railhead of Misamari and 60 km from the road head of Tawang. The Nyamjang river flows through from Tibet and enters India at Khinzemane. It meets Namka Chu 1½ miles south of Khinzemane. Local grazers used seven improvised bridges to take their cattle across the Namka Chu. The Thagla ridge which sprawls from west to east overlooks Namka Chu and has four prominent passes Dum Dum La (17,000 feet), Karpola II (16,000 feet), Yamatso La (16,000 feet) and Thag La (14,000 feet). The dispute in this area revolved around Thagla Ridge. The Chinese claimed it was on the Tibetan side and India claimed it was on its side of the McMahon line. Accordingly, in 1959 an Assam Rifles post was established at Khinzemane. The Chinese disputed it and a force of 200 Chinese pushed back the weak Indian force towards the bridge on the Nyamjang Chu at Drokung Samba which they claimed was the McMahon line. After the Chinese retired the Indians again reoccupied the post. The skirmishes began on 10 Oct 1962 and soon escalated into a full scale war. On 20 Oct at 5:14 a.m. enemy’s 150 guns and mortars opened upon all the localities at Namka Chu and Tsangdhar. Capt Mahabir Prasad from 1 Sikh was attached with 1/9 Gorkha Rifles deployed in that area. In the evening 500 Chinese troops attacked the positions with heavy artillery, mortar and other medium machine guns. Capt Mahabir Prasad fought valiantly along with his troops and inflicted heavy losses on the enemy. However, Capt Mahabir Prasad along with his comrade Lt Mahindra got wounded seriously during the attack. Capt Mahabir Prasad was martyred and was awarded the nation’s second highest gallantry award ” Maha Vir Chakra” for his outstanding courage, leadership and supreme sacrifice. Captain Mahabir Prasad performed repeated acts of bravery during the whole period of operations in the Namkachu area in NEFA. On 20 October 1962, when the Chinese attacked our positions in overwhelming numbers with heavy artillery, mortar and medium machine gun fire, Captain Mahabir Prasad led a handful of men against the waves of advancing Chinese and inflicted heavy losses on the enemy. His determination and courage were in keeping with the highest traditions of our Army. The Housing project of Mahabir Vikas in Calcutta was named after Captain Mahabir Prasad. A thousand salute to the brave soldier.